Baja Sim San Jose del Cabo (MMSD) for FS2004 was released at Baja Sim . · Custom vehicles, vegetation, signs, etc! · The best scenery for a mexican airport available!!! 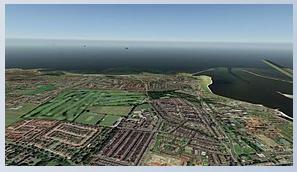 RC Simulations UK Photo Scenery for X-Plane 9 is now available for shipping from X-Plane.org. "This new scenery is the best photographic scenery ever published for X-Plane 9 "
Tecnam P92 by DMAX for X-Plane has been released at X-Plane.org. "The P92 is an advanced microlight, two-seater side by side, single strut braced, high wing aircraft. The plane outstanding performance and flying qualities together with low operating costs, easy piloting and maintenance, make of this aircraft an excellent solution for the flying-schools and training activity and also for many other mission as touring, territory surveillance, patrol, etc." Now with the "dummy" GPS-moving-map on all the three versions. Pacific Islands Simulation VFR Appalachia for FSX has been released. Pacific Islands Simulation . "VFR Appalachia is first in our series of highly detailed east coast USA airports meant for pilots who prefer to fly the mid-Atlantic region. As the product title suggests, our aim was to recreate real-world airports in FSX for those who prefer low and slow short hops between airports. The eight airports in this series were developed from our on-site visits and birds-eye-view shots from our pilot - Jay, so what is rendered in FSX is what was captured realistically from real-world." · custom runway/apron ground poly. · multitude of custom 3d objects (eye candies) pertinent and regional to each airport. What you see in the sim is based on actual photographs from our on-site visits/photographs. 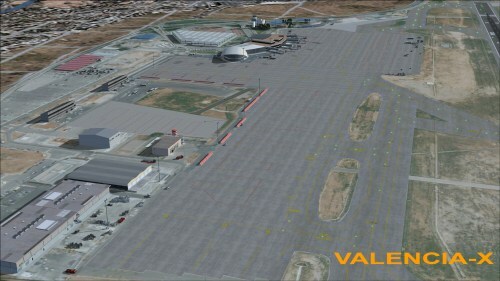 Akesoft Valencia X (LEVC) Freeware for FSX and FS2004 is available for download at Akesoft . 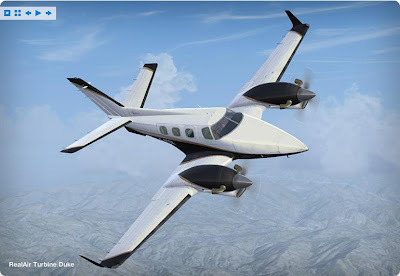 RealAir Beech Duke B60 Turbine Version has been announced, more information at RealAir Simulations . Canadian Rockies for X-Plane by Tom Curtis has been updated to version 1.20. X-Plane.org. "From the farmlands and forests of eastern Alberta to the rugged snow capped peaks of British Columbia you’ll find a scenic paradise for all types of pilots. 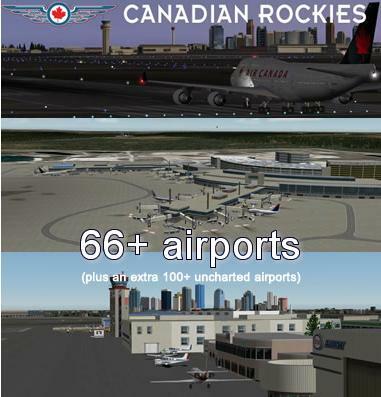 CANADIAN ROCKIES 66+ airports and seaplane bases are ready for your next X-Plane adventure, be it IFR or VFR. Take a tour of the entire front range of Alberta, enjoying over 700 miles of uninterrupted custom scenery from the United States border in the south to Fort Smith in the north. If bush flying is your thing, challenge yourself to some of the packages more demanding destinations, from high mountain lakes to glacier runways. Heavy metal pilots will find both Calgary and Edmonton International Airports faithfully reproduced, as well as numerous smaller regional hubs stretching all the way to the Yukon Territories. Military pilots can take part in Maple Flag, the multi-national war games hosted at CFB Cold Lake"
Navigraph NAVData AIRAC Cycle 1101 is now available at Navigraph. iFly 737 Service Pack 1 Revision 3 has been released. More information in the iFly Forums. -We added an extra lighting intensity to the VC, so now we will have dark - normal - storm. What used to be "normal" is now considered "storm"
-Updated the "aircraft.cfg" with the correct fuel tank size, also update the Configurator so it also includes these numbers. Note that fuel tank size in FSX is based on gallons not lbs and in FSX fuel weight is relatively high so although the volume is correct the weight will be a bit too high. "VRS today released Service Pack 1 for their award-winning F/A-18E Super Hornet simulation for Microsoft Flight Simulator X. SP1 contains over 200 changes, features and fixes spanning 10 incremental point releases over approximately 4 months. SP1 will be automatically delivered via the VRS Aircraft Manager for any version. Customers wishing to download the SP1 update manually, or to review the changelog, may do so via the VRS Support forums at http://www.vrsimulations.com." Note that all third-party liveries should be exported via the ACM and then deleted (also via the ACM) before performing this update. They may then be re-imported normally after the update is completed. Dozens of avionics changes based on recently obtained data and first-hand actual simulator time. Dedicated multiplayer model options (available via ACM preferences) which offer higher performance through LODs and now accurately reflect other player's loadouts. Improved Autothrottle response and accuracy. Improved Autopilot function, particularly RALT and BALT. Rewritten radar backend will now display all simulated aircraft, including those in FSHost/SquawkBox/IVAO sessions and those created by FS Recorder. YCAS rewritten to deal with the uncorrected oscillatory nature of FSX wind gusts. The YCAS controller is more responsive and significantly stronger. Frame rate improvements in the external model (should help in SP when in an external view, and help greatly in MP). Enhanced HUD appearance and more closely matched geometry. HUD masked to HUD frame for TrackIR users. Refined DDI appearance and higher resolution symbology, particularly in radar displays. ASv6.5 B554 is now available. This update solves a problem with historical weather downloads when the date requested is in 2011. This is a recommended update for all ASv6.5 users. This update does not apply to ASX, ASA and/or ASE users. To download the free update, visit the Support and Downloads section. FSBuild version 2.4 adding support for Navigraph NavData, iFly 737, Google Maps and many other fixes is available in the FSBuild Support Forums. VRS TacPack has been announced, more info at Vertical Reality Simulations . It's been quite a year for us here at VRS. After completing our FSX version of the Superbug, we spent many months working on service pack 1 and we'll be releasing it any day now. We want to thank everyone who participated in the open beta. Thanks to your efforts, we've got an extremely tight release with over 200 changes/additions and fixes. Before we started working on SP1 in earnest, we were tinkering away in the laboratory concocting something that's turned out to be nothing short of revolutionary for FSX. We've got a little way to go before release, but it's almost here and when it arrives it's going to rock your FSX experience in a way that's never been done before. We call it the TacPack, and it was conceived and developed by our resident evil scientist. The TacPack is a complete single and multi-player combat system for FSX, featuring true lethality in both air-to-air and air-to-ground roles. The TacPack will initially be deployed for the Superbug, followed by SDK and drop-in support for third-party aircraft in subsequent release phases. The TacPack will begin pre-ordering this month at a substantial discount for existing Superbug customers. Without further adieu, VRS and JaggyRoad films give you the debut video for VRS TacPack! A high resolution version of the TacPack video can be downloaded here. FlightBeam San Francisco Intl. Airport X preview screenshots can be viewed in the FlightBeam Forums . Here we have scenes from a suburban neighborhood in X-Plane 10. It features a variety of houses, trees, and cars, with the sort of sprawling, haphazard layout seen in suburbs across the US. The scenery here is still "in progress"--there are a few artifacts here and there, and it's a bit repetitive in places--but it does exemplify the kind of look we're going for in Version 10. These images were taken on a latest-generation iMac--a nice machine, but the specs on it are not spectacular for home use. Our (quite acheivable) goal is to have this level of detail (or near it) available on any moderately fast home computer. In practice, X-Plane 10 should be reasonably scalable, with nice graphics for high end machines and the ability to turn off resource-intense features on slower machines.